There has been a recent controversy in Ontario politics with Liberal leader Kathleen Wynne declaring that Doug Ford, the latest provincial leader of the Progressive Conservative Party of Ontario is similar to U.S.A. President Donald Trump of the Republican Party. Nothing could be farther from the truth. While it is a fact that both are the spoiled sons of wealthy men who inherited their father’s money, so much about them is different. And while it is a fact that both the Republicans and the Conservatives use the same marketing teams for electioneering (not sure about Facebook mining), and that Donald holds lavish events at Mar a Lago while Doug hosts BBQs for Ford Nation in his backyard, it really is unfair to draw a comparison between Donald Trump and Doug Ford. First, Donald Trump is a billionaire and Doug Ford is only a millionaire. Secondly, Donald has a full head of blonde comb over hair and Doug has short cropped blonde hair. 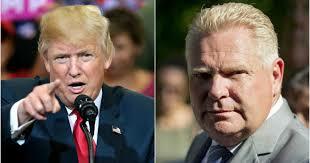 Thirdly, Donald tends to an orange complexion while Doug Ford tends to ruddy. Fourthly, Donald allegedly enabled sexual assault abusers wile Doug alledgedly enabled addicts. Donald had no legislative experience while Doug had one term in the most dysfunctional city council in municipal history. Despite the fact that the U.S. economy and employment were on the upswing under Obama’s Democrats, and that the Ontario economy and employment were on the upswing under Wynne’s Liberals, why confuse the masses with facts when you can convince them to deny the birth certificate and “Burn the Witch!” Admittedly it’s hard to “Lock Her Up!” or “Put Her in Jail” if “she” hasn’t been charged or convicted of anything. But that never stopped a bullying populist liar before. No, Doug and Donald are two different people. Although they do wear suits cut from the same ideological cloth, and Doug is reported to have mastered the art of the deal in his youth. one is from America and one is from Canada. We always thought we were a kinder, gentler citizenry than our neighbours to the south, but if Doug Ford is elected Premier of Ontario we’ll find out that we’re really not that different at all. It will be like watching Anne of Green Gables lose out in the cable TV ratings to Keeping up with the Kardashians. As Kathleen Wynne tweeted “We’ve seen this movie before,” shortly after Christine Elliot won the popular leadership vote but Doug Ford won the PCPO leadership via the Ontario Conservatives version of the Electoral College, I just never thought that it would be playing in theatres across Ontario. Although it has not yet been confirmed, there is a rumour that David Price will be head of security at Queen’s Park, and Don Cherry will be making the introductory speech from the throne before taking over as Minister of Hockey if Ford is elected. Get ready for four years of rock ‘em sock ‘em politics.